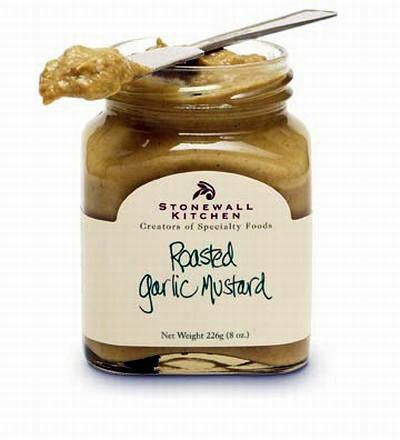 Stonewall Kitchen Roasted Garlic Mustard - slow roasted garlic adds great flavor to this stone ground mustard. The sweet caramelization of slow roasted garlic makes this Stonewall Kitchen Roasted Garlic Mustard a pantry classic with endless possibilities. Spread mustard on focaccia & top with slices of grilled eggplant, peppers, portobello mushrooms, & Provolone cheese. Stonewall Kitchen Roasted Garlic Mustard.